Jaipur, May 16: In a shocking incidence of caste violence in Rajasthan's Nagaur district, the dominant Jat community allegedly mowed down 3 Dalits by tractors following a long pending land dispute. The violence was triggered after a popular member of the Jat community was killed in firing by Dalits in Dangwas village. Scores were injured in the clash and thousands of Dalits have fled from neighbouring villages to save their lives. The administration has deployed heavy police force to enable funeral of those killed and restore peace in the area but no arrests have been made so far. As per reports, horrific crimes were also committed against dalit women, including molestation and beating. Some have also complained of attempts of disrobing. As per a report published in TOI, the dispute relates to a 20 hactares farm land claimed by dalit families of Ratnaram Meghwal, Gutaram Meghwal and Khemaram Meghwal, but disputed by the family of Chimnaram Jat. The row has been pending in court for years. Farmer commits suicide in Rajasthan after he failed to receive compensation To solve this issue Jats on Thursday called for a panchayat, which the Dalit families reportedly feared that Jats are going attack them, and shot at the two members of the Jat community in which one was killed. This enraged the Jats who attacked the Dalit families with their tractors. 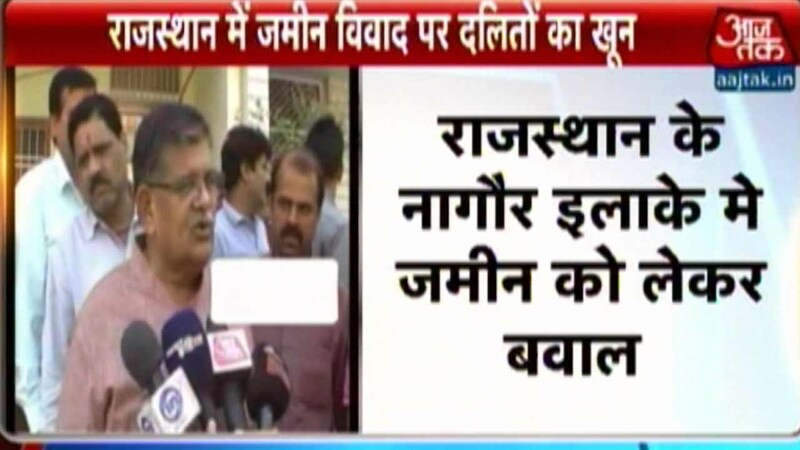 Reacting media question on why no arrest has been made till now, Rajasthan's Home Minister Gulab Chand Kataria came up with a bizarre excuse saying the government doesn't have any magic wand to catch the culprits. "Koi aisa jaadu toh nhi hai hamare paas,ki turant aadmi ko dhund le," Kataria was quoted by ANI as saying.